This is beautiful, Debra. I'm also doing the Sketchbook Project the title is "This is not a Sketchbook". Not posted any of the pages yet but will get around to it soon. Looking forward to seeing more of yours. Looks like a great start...and a great breakfast! I'm leaving the cover until later too. I did the sketchbook project last year. Looks like you are off to a great start! I'm so impressed with your "sketches"! This one is amazing, as usual! I'm so looking forward to seeing your sketchbook filling up! Great start Debra. I'd definitely eat dim sum for breakfast if I was there and it looked like your drawing! LOVE it! my sketchbook has just been mailed to me, so i'm still thinking on what to do on mine! Welcome to the Sketchbook Project! Your paintings are just gorgeous, let me know how you go with the paper. 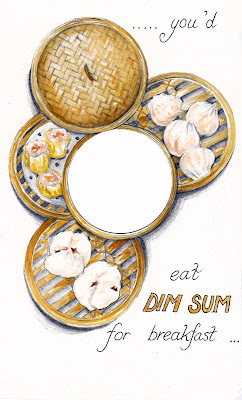 Beautiful start to your drawing...makes me hungry for dim sum! I thought immediately- beautiful. And then I see many of the comments include that very word. Interesting. Your composition is lovely, your lettering perfect.